As fundraising technology has become nonprofit mainstay, fundraisers are adding new strategies to their events and galas. If your team is looking for cutting-edge innovation and engagement, explore a new form of peer-to-peer called based Ambassador Fundraising. For those that aren’t familiar, peer-to-peer (P2P) fundraising harnesses the influence and power of peer networks by engaging supporters to amplify your cause, fundraise, and help you reach a wider donor network. Ambassador Fundraising takes social fundraising to the next level. It leverages peer fundraising in conjunction with galas, auctions, golf outings, or any type of event. Nonprofits tap “ambassadors” (a.k.a ardent supporters, champions, highly visible supporters) to fundraise leading up to your event. It’s the perfect way to broaden giving networks, leverage social fundraising, and drive higher proceeds to the bottom line. So, join us and explore a whole new world of fundraising! 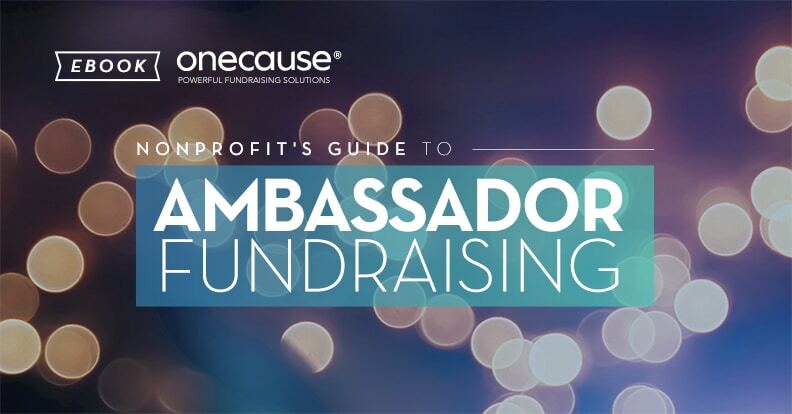 This nonprofit guide dives into the world of Ambassador Fundraising, how to get your top supporters on board, and best practices to implement at your next gala or event. How Does Ambassador Fundraising Re-Energize Events? Let’s face it – every event has a lifecycle. After a few years, even the best gala, golf outing, or fundraising campaign needs an injection of creativity and energy. Enter Ambassador Fundraising, aka the perfect way re-energize events. Tapping your supporters and turning them into active fundraisers with the right tools provides an instant way to grow your networks and drive increased revenue. Engage top supporters before, during, and after your event. Connect your event to a larger social audience. Add gamification, excitement, and competition. Create new engagement and revenue streams before your event even starts! How does Ambassador Fundraising work? Ambassador fundraising is a peer-to-peer campaign that mobilizes loyal supporters to conduct personal fundraising on the behalf of your organization. It often takes the form of contests, challenges, campaigns, or team fundraising for your signature event. Ambassadors are chosen, given social fundraising tools, and turned loose to fundraise. They use individual fundraising pages to secure donations from their social networks and attract supporters to your event. They fundraise for the months and weeks leading up to your event to raise funds and encourage more people to attend. Then, at your gala, the fundraising culminates with a winning ambassador being selected. It’s this competitive element that motivates ambassadors and their supporters by generating giving momentum and proceeds, rolling into a signature event. Showcasing an ambassador as the highlight of your gala can really take your event to the next level. One of the most important keys to success are the ambassadors themselves. Selecting the right ambassadors can be the difference between a fundraising success and coming up short. Ambassadors should be people of influence, who have strong networks and social clout in your community. They must be outgoing, engaged, and well connected. They can be people who already know your cause, but they don’t have to be. A well-oiled ambassador fundraiser should have a minimum of three ambassadors competing, but you can tap into more if you have them. For those with large bases, create a group-based ambassador campaign, where teams fundraise, to compete for team glory! Your board members: Board members are natural ambassadors. They are already dedicated to the success of your nonprofit. They often have large professional and personal networks, making them perfect social fundraisers. Engage them at a new level and watch turn their contacts into supporters for your event. Your volunteers: Volunteers are another reliable source for ambassadors, since they are deeply involved with your cause. They are used to giving their time and talent to your efforts.Target your most active and generous volunteers and ask them to join your ambassador campaign. People with serious clout on social media: This is a great place to look if you’re just starting your ambassador program. Look for local personalities with a lot of friends, tons of social interactions (likes, comments, etc. ), and an active social presence. Sponsor connections and networks: Ask your sponsors and long-time community partners if they know of potential ambassadors. Call in those favors to get great ambassadors working for your team. The event committee. The people working on the event itself are passionate about the outcome! Tap the most dedicated to be your ambassadors. Asking someone to be an ambassador doesn’t have to be daunting. Look for people in your network who have a passion for the mission and values of your organization. Most of all, think of your ambassador program as an honor – they can create rich traditions and hold community cache. Carry that badge of honor mentality into your ambassador asks. Next, it’s time to get your Ambassador Fundraising campaign off the ground! Like any campaign, a successful fundraising campaign takes planning and focus, especially when it’s part of a larger event. Start early to give ambassadors enough time to get up and running on your social fundraising platform. Here are tips to plan out your campaign so there are no questions down the road. Awareness campaigns leading up to your event to build excitement. Holding a competition to drive donations. Engaging ambassadors or sponsors to promote event attendance. How will you run your campaign? It’s important to define your contest elements in advance so you can clearly communicate the details to your Ambassadors as well as to the public. Determine exactly what you’re going to ask ambassadors to do (e.g., ticket sales, sponsorships, donations, social awareness). Decide how you’ll chose ambassador winners. Brainstorm other ways to recognize, motivate, and thank ambassadors throughout the event. Determine how you will incorporate the ambassador fundraiser into your overall event on the day of. Create a marketing plan and involve traditional event logistics. Decide how long you’re going to give ambassadors to campaign (usually a few weeks before your event date). What are your program goals? Clear goals are a must for any successful nonprofit fundraising campaign, and Ambassador Fundraising campaigns are no different. Sit down with your ambassadors one-on-one and discuss the goals of both individual and collective campaigns. Set clear guidelines (aka, how much money do you expect them to raise or how many tables they should sell). Share history, past trends, and fundraising successes. Talk about the competition length, rules, and how the winner is selected. Finally, share levels, accolades, and those motivational rewards that will get everyone excited! How will you onboard Ambassadors? This is when you’ll introduce your ambassadors to the technology they’ll be using and the marketing in place for their campaign. Walk ambassadors through their individual fundraising page, and how to personalize. Show them how donors use the technology to make a donation. Highlight the marketing efforts your team has in place. Go over all social media guidelines, including hashtags they should use, accounts they should tag, etc. Review any flyers, social, or website content that has their name or photo attached as a courtesy. Ensure ambassadors and their networks are engaged up until the moment your gala or event starts. Add an extra layer of social engagement and competition to your planning. Include a real-time leaderboard on your website and individual ambassador pages to keep everyone in the loop. Link real-time social feeds on the ambassador pages and your gala or event website. Add milestone tracking and badges to give ambassadors continual encouragement towards fundraising goals. If you’ve chosen an ambassador winner before your event, include a leaderboard with donation totals for extra engagement. During your gala or event, it’s all about engagement. You want your attendees (many of whom have most likely donated an ambassador) to learn about the overall fundraising campaign, mission, and connect with your ambassadors. As with any competition, announcing your winner can be tricky. If you’re announcing the winner at the gala, make sure to congratulate and thank all participating ambassadors for supporting your organization. If you announced the winner beforehand, still have a moment of public recognition for all of ambassadors at the event. After the event, celebrate, but keep going! Take the time to execute on a well-thought-out follow-up process and post-event engagement plan. Start thinking about how to leverage your existing ambassador network and continue the excitement for your cause long into the fundraising year. Ambassadors have done a lot for your organization and brand, so make sure you go all-out with thank you’s. Send a handwritten note and a token of gratitude to all ambassadors. Add in a special thanks to the winner (or winners) as an additional recognition. Include information your follow-up about next year’s event and ask if the ambassador would like to reprise their role. Make sure you let attendees, supporters, and donors know how much you raised and what you plan on doing with the ambassador-raised funds. Restate the goals in your follow-up and on your website even if you announced the totals at the event. Work with ambassadors to determine where funds will be allocated as part of the campaign. Share project updates with donors as a way to continue engagement. Celebrate the success of your ambassadors with your team, at your gala, and after the event. Host a luncheon for your ambassadors to make them feel special and valued. Congratulate your ambassadors, team, and donors alike for their successful involvement. Celebrate by highlighting the success of your peer-to-peer campaign. Your gala or event may be over, but now’s your chance to thank your ambassadors and share highlights of your event. Add an online photo album to your website specifically for the event. Issue a post-event press releases highlighting the success of your ambassador campaign and the overall success of the event. Feature profiles your ambassadors in all of your organization content, such as in newsletters and on your website to thank them for their efforts and congratulate the winner. Now onto the fun part! After taking a well-deserved break, start thinking of new and exciting ways to build on your Ambassador Fundraising campaigns for next year’s gala or event. Think of new ways you can work with Ambassadors. Come up with new contacts to add to your Ambassador roster. Circle back on the gala itself and brainstorm some new campaign ideas. Be creative, proactive, and work ahead to make next year an even bigger success!